← Bishop Franklin Calls For Prayer In Response to Violence. We had a series of conversations around the Diocese called: “Be Not Afraid” and a follow up series called “Take Heart” over 400 people participated in these conversations. Speaking to the public outside St. Paul’s Cathedral in Buffalo on a recent dreary day. In April, the Episcopal Bishop of Cuba invited a group of American Episcopal Bishops to visit the Church in Cuba – here is a picture of us in one of the churches there. 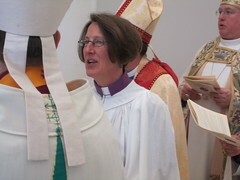 In the summer the General Convention of the Episcopal Church met in Salt Lake City. 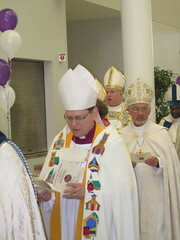 I served on the Presiding Bishop nomination committee. I was thrilled that Bishop Michael Curry was elected. Western New York held the inaugural Eaton Reading Program. Our Diocesan Ministry Center rang with the voices of children, and missioners from around the country. 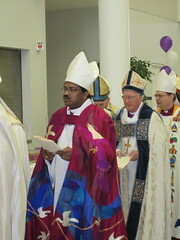 In the fall Bishop Curry visited to celebrate the 10th anniversary of the ministry of Gloria Payne-Carter at St. Philip’s, Western New York helped host the International Anglican-Orthodox dialogue, and Bishop Curry was installed as Presiding Bishop of the Episcopal Church. And of course, I visited many, many congregations, including the 200th anniversary of St. James’, Batavia. I also collected more ducks. We had our first Diocesan Family Camp, went to Darian Lake Amusement Park and Food Truck Tuesdays at Larkinville, and Shakespeare in Delaware Park. I worked with Roman Catholic Bishop Malone, Buffalo Mayor Byron Brown and State Assemblyman Sean Ryan on issues of equality in Buffalo and Western New York. Looking back on it, it certainly was a busy, energetic and hopeful 2015. I pray that 2016 will bring Christ’s blessings to you, your family, our Diocese and our region.